"Let's be honest, I'm the hero Britain needs." Hero of the Nebula Wars, Guardian of the Golombic Spar. Feared by gentlemen, admired by ladies, despised by the French! At least, that's what he hears in his head. Dashworth wants to be the greatest hero in the universe (and occasionally thinks he already is) and won't let little things like a lack of expertise and no patronage with the Royal Space Navy get in his way. He's procured the good ship Jolly Good, a rapier, and an attitude, and has a bagful of tricks and a misfit crew to bluff his way into the history books. Certainly charismatic, Dashworth learned much about adventure from his storybooks as a boy, and believes he knows exactly how his exploits should play out; even to the point of delusion. 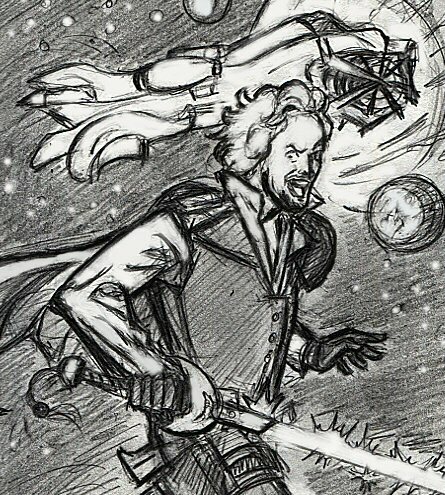 He's become a space adventurer extraordinaire, and the self-styled hero of the British Empire and protector of English sovereignty as he traverses the Fifteen Galaxies as a dashing space-captain. If there's a princess around, he'll be sure to rescue her, even if she doesn't need rescuing at all and is doing just swell on her own, thank you very much. Once a lowly Tea Ambassador with the Mother's Brown Tea Conglomerate, Dashworth carried out his rounds in London while shilling his sensationalist chapbooks, titled "Penny Amazings", to several disinterested publishing houses. Deciding to establish himself as a home-grown hero by staging an elaborate spectacle with his writer Quilton, Dashworth earned himself a deal with the Plinkington Publishing Group and set out to have cosmic adventures for Quilton to write about. After proving himself the Hero of Vorgak 3, Captain Dashworth earned his commission as a Special Envoy Privateer in the Royal Space Navy, and set off on adventures aboard the Jolly Good. As Christmas approached, Dashworth attempted to make time with Princess Victoria, but the menace of a mechanical spider put paid to festivities in the British embassy on Glimbork 3. Hoping to catch a well-earned rest from his adventures, Dashworth set out to pay a visit to Buckingham Palace on Christmas Eve, and arrived at the princess's window bearing gifts and a strand of knotted tinsel wrapped around his indignants.